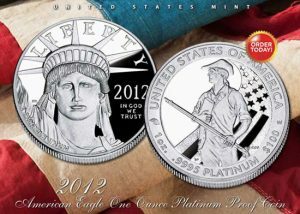 On Thursday, August 9, 2012, the United States Mint added the 2012-W Proof American Platinum Eagle to its line-up collectible products. At a price of $1,692.00, the new coin is starting out $400 lower than last year’s initial price due to the reduced cost of platinum. With a purity of 99.95% platinum, the one ounce American Platinum Eagle appeals to both collectors and investors, especially now that the U.S. Mint has not released a bullion version since 2008. Up to 15,000 of the $100 denominated coins, the largest face value given to any U.S. coin, will get produced. The maximum mintage is the same as last year’s coin. A new "To Provide for the Common Defense" theme is illustrated on the reverse of the 2012 strike, making it the fourth issue in the six-year "Preamble Series" that began in 2009. This year’s design was created by U.S. Mint Artistic Infusion Program Associate Designer Barbara Fox and sculpted by U.S. Mint Sculptor-Engraver Charles L. Vickers. In the center of the design is a minuteman from the Revolutionary War. He is facing forward but his head is turned to one side. In one hand is a rifle and the other a book held close against his chest. The minuteman represents the country’s early defense, and the book shows the importance of knowledge in defending the nation. Behind him are the stars and stripes of the American Flag. Surrounding the image are the inscriptions, "UNITED STATES OF AMERICA," "1oz.," ".9995 PLATINUM," "$100," and a "W" mint mark to indicate the coin’s production at the U.S. Mint facility in West Point, New York. Between "1oz" and "UNITED" is an original "coin punch" from an American Eagle privy mark identified at the United States Mint at Philadelphia. Back in 2009, the U.S. Mint began a six-year series to annually rotate the reverse designs of the American Platinum Eagle to commemorate the six principles of the Preamble of the United States Constitution. Inspiration for the designs comes from narratives prepared by U.S. Chief Justice John G. Roberts, Jr.
Each year, the obverse portrays one image, a close up portrait of Lady Liberty looking forward toward the future. It was designed and engraved by U.S. Mint Chief Engraver John Mercanti. Inscriptions are "LIBERTY," "IN GOD WE TRUST," "E PLURIBUS UNUM" and the year, "2012." These Eagle edges are reeded. The one ounce proof American Platinum Eagle is neatly packaged in a custom-designed portfolio presentation case that includes Roberts’ narrative. is still available, however, and is being offered at the same price of $1,692.00. Exactly how much longer the older coin will be offered is hard to say, especially since it is 240 orders away from a sell-out status, as of August 6. Both the 2009- and 2010-dated Platinum Eagles sold out within nearly one week from their launch, but mintages were much smaller. To illustrate some of the differences between the coins within the Preamble Series, check out the chart below that offers release dates, maximum mintages, sales and initial prices. *The U.S. Mint bases the prices of their coins containing precious metals, for platinum and for gold, on the average weekly price of the metal on the London Fix. Each Wednesday, the U.S. Mint recalculates the average and reevaluates whether its coins’ prices should change. The 2012-W Proof American Platinum Eagle may be purchased directly from the United States Mint via the coin’s dedicated online page or by phone at 1-800-USA-MINT (872-6468). A shipping and handling fee of $4.95 will be added to all domestic orders. To start, there is an ordering limit of five per household. Last year’s similar household limit lasted for about one month. Looks exactly like the Lexington minuteman statue. Real original. The US Mint designers are not known for their originality or esthetically pleasing designs. Why do you think the gold and silver (and palladium if it happens) eagles and 24K buffalo are all using designs developed back in the early 1900’s? Nobody these days can come up with anything that even closely approximates what the people of vision from back then were able to do. Should have put OLD IRON SIDE on the coin.